I spend quite some time on my “FONTS COLLECTION” for the MS DOS ANSI/ASCII Text Editor “TheDraw“. The font file is in binary format and I wondered how it is structured to maybe write later some tools around it, like a Font Viewer for Windows, Converter to and from ANSI and stuff like that. Note that this is not an official specifications document, I reverse engineered it by testing, so there might be cases I am unaware of, although I am pretty confident that I covered everything about it. “TheDraw” Fonts Files have the extension “.TDF” (which is short for “TheDraw Font” duh :)). One .TDF Fonts file is by default designed as a “collection” of multiple fonts, even if it only holds a single font (like after exporting a single font to an extra file). It can hold up to 34 fonts. More are not possible, if used with TheDraw itself or with it’s external TDFONTS.EXE Fonts Editor utility. An empty fonts file without any font in it yet is always 232 bytes in size. The actual character data are always stored after those 232 bytes and can vary in size, depending on the size, type and complexity of the font characters. Every additional font added to the collection is 212 bytes long if without any character data. 233 BlockSize Character Detail Data ?? ** The Max Height Value is not reliable. If a line ends with a &, this line is not counted in the Max Height. For Example, if a character is 6 lines high and line 5 and line 4 end with a & character, the value for Max Height will be 4 and not 6. The Max Height value can only be used to determine the “Line Height” to determine where to position the cursor after a line-break. To read the full character data, always read to the Null (Chr(0)) terminator. The individual characters for Fonts of type “Block” or “Outline” are single bytes only where “Block” using the actual ASCII character code. For Fonts of type “Color“, each character takes up 2 bytes. The first byte is the character itself and the 2nd byte is to specify the background and foreground colors used for the character. “Outline” Font Types store Letters, which are used as character reference. For visualization purposes you might want to use the following mapping. A ??? 205 / CD ?? ?? B ??? 196 / C4 ?? ?? C ??? 179 / B3 ?? ?? D ??? 186 / BA ?? ?? M ??? 181 / B5 ?? ?? N ??? 199 / C7 ?? ?? O ??? 247 / F7 Hard space for all spaces inside a character ?? @ @ 064 / 40 Filler for all leading spaces ?? & & 038 / 26 Descender mark ?? 00 - FF, the first part (or Floor(Value / 16)) holds the background color (0,1,2,3 .. max. 7) and the second part (or Value mod 16) holds the foreground color (0,1,2,3 .. max. F). See the Color Table below for the available colors. A character value = 0 (Null) indicates the end of the current character (Note: that a color value of “00” for fonts of type “Color” is perfectly legal and should not be interpreted as Null termination). If the current line is being terminated before the specified “Max. Width” is reached, everything after the break will be treated as non-existent or transparent space. I tried to illustrate this behavior in the following drawing. If the characters of your “Color” font are too large, TheDraw might run into a problem because the space needed exceed the maximum possible offset value in the font base definition. Keep in mind that only 2 bytes are reserved, providing a max. offset of 65534 (=FEh, remember that FFh = no character defined). Taking a color font using 2 bytes per char and maximum dimensions per character of 30×12 + up-to 11 line-breaks and 1 null termination for a total of 94 characters, you are running out of address space much earlier than the end of character 93. Remember that the “Outline” font type has restrictions regarding the use of characters. Those rules are enforced by the font-editor tool though and not by the font file format, so be careful, if you are going to create new .TDF font files yourself. If a character is created using the “Copy” character feature by the TDFonts.exe font editor, the target character will point to the same offset position for the character data as the source character. Only if the target character is changed afterwards will the character data be stored at a different offset location. This reduces space and can be solution for the address space issue mentioned at the first bullet point. ??? ??????????????? ??????????????? ??? ??? ??? ????????????????????????????????? ??????????????? ??? ??? ??????????????? ??? ??? ????????????????????????????????? ??? ??? ??? ??? ??? ??? Pay special attention to how the top/right of the outside border, and the bottom/left of the inside border were done. Of particular importance are the corners. The following characters must be used in the described locations. Double lines are always the rightmost side of a column. Double lines are always the topmost side of a beam. Others symbols may require them also, depending on how your font is designed or implemented. That’s all actually, there is nothing more to it I believe. I am pretty sure that you will hear more of this from me in the future, probably some kind of tools, which I already mentioned briefly at the beginning of this post. I hope that you find this information useful. Let me know, if you decide to do something yourself with this information and write some tool of your own etc. Just contact me :). 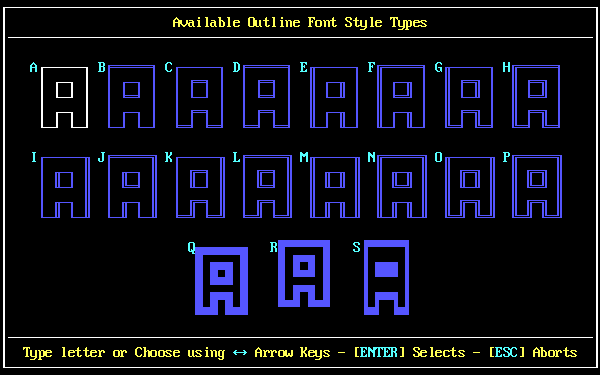 Previous Post: … And More TheDraw ANSI & ASCII Fonts!